Making a move is a task that many of us undertake in our lives. The thought of moving may seem like a difficult and emotional process, but it’s something that you will always remember as a transition from one part of your life to the next. You can make this time of you life a lot less stressful when you know the mistakes you should avoid. With everything that goes into getting ready for a move, it’s easy to have a misstep or two. But, we’re going to give you a heads-up of the mistakes to sidestep on your move. Taking EVERYTHING with You: Before you move, you need to have a thorough look at what you’re actually going to take with you. This means going through all of your belongings and figuring out what you don’t use anymore. You’re going to need as much room in the movers’ truck as possible, so having any space taken up by stuff you don’t need is going to be a waste. Moving all of those unneeded possessions, only to toss them away when you get to your new house, is not going to be a good use of your time. Get rid of your unwanted items through a yard sale, donations, or simply discarding them if you know nobody will get any use out of them, and then focus on bringing only the stuff you know will be used in your new home. Using Old Boxes: As you’re packing your stuff away, it’s understandable you’ll want to use some boxes you have around the house, instead of spending money on new ones. However, it would be in your best interest to forgo boxes you’ve stored around the house and purchase unused ones. Any boxes you have around the house are probably dusty and not as strong after having other possessions stored in them. You don’t want to be carrying a box packed with your belongings, only to have them fall through the bottom and possibly break the items or hurt yourself. For any items that are very breakable, make sure to have enough bubble wrap in which to encase them before you place them in a box. With multiple items in any box, you don’t want them hitting against each other and causing damage. After the bubble wrap serves its purpose, you can embrace your inner child and pop the bubbles! Choosing a Moving Company at the Last Minute: When preparing yourself for a move, you have to take into consideration that the late spring and summer are typically the busy season for moving, especially because you have families with children who want to move to their new home before the start of the next school year. A lot of the best moving companies get filled up with appointments early, so as soon as you know the date, call the moving company to book your move. If you wait until the last minute, you run the risk of not getting an appointment when you need it, and then you’ll probably have to resort to a lesser company. Forgetting to Ask for an Estimate: Before you choose the moving company you would like to work with, it’s important you first receive an estimate, especially because there are two kinds that are offered: binding and non-binding. A non-binding estimate provides you with an idea of how much the move is going to cost, based on how far you’re moving and the mover’s estimates of your contents and the size of your house. The estimate is given in writing, and you can only be charged 10 percent more than the original estimate. With a binding estimate, you have a legal document that explains all of the charges, which can’t be changed unless you ask for add-on services, such as the movers having to climb multiple flights of stairs they didn’t have previous knowledge about. Prior to making your final decision, it’s recommended you receive at least three estimates, and also ask about any hidden fees. If you’re already spending money on the move, you certainly don’t want to be hit with any unexpected expenses. But, don’t be afraid to spend extra money on a reputable mover because if you find a moving company that charges significantly less than others, it’s probably safe to say they don’t offer top service. Not Asking Your Moving Company If They Have Insurance: You also can’t forget to check that your moving company has insurance. Once you get to your new house, you don’t want to have any problems arise when you’re so close to finally settling in, so if a mover accidentally damages any valuable items upon the move, you want to make sure the company will be able to pay for them. If your moving company has insurance, I guarantee it will allow you to relax more. After you look into the insurance details of your movers, review your home insurance to make sure it covers your possessions as they move from one residence to another. If you need it, moving companies provide customers with deals on any extra insurance you may want. Lastly, you should inquire if your mover has insurance for workers’ compensation. If you have a small moving company helping you out, which typically has less than five employees, there’s a chance they won’t offer this, which means you’ll have to pay for an injury if a mover gets hurt. In the end, find out as much as you can about the moving company’s insurance, and use that as one of the deciding factors as to which company you choose. Not Checking Out the School District: If you have children, you’ll want to see if the area to which you’re moving has a school district you approve of. Then, if you like it, you have to make sure it has openings, as you don’t want to move to a new neighborhood and have your children be without a school. Once you pick a district you prefer, keep in contact with them to make sure everything is in order for your child to attend come September. A school may be one of the last things on your child’s mind (I should know, as I was young once), but it should be one of the first things on yours. You want your child to have a bright future, and that begins with finding the right school. Thinking Your Belongings Will Arrive When You Do: This is a mistake to avoid if you’re moving to a whole other part of the country. Don’t assume the movers will be at your doorstep waiting for you when you get there. If you’re relocating a long distance away from your old home and you arrive at your new home well before the movers, it’s best to have an emergency kit on hand that has enough essentials to get you through a few days. You should include toothpaste, toothbrushes, soap, shampoo, extra clothes, and anything else you think you may need to tide you over until the rest of your belongings arrive. It’s an inconvenience to have to wear the same outfit two days in a row, so imagine what it will be like having to do so for longer than that. Packing Your Tools and Work Gloves Where You Can’t Get to Them: During your move, make sure you have your work gloves and tools easily accessible, instead of having them buried in a box. You won’t only need them for opening boxes, but you may have to remove a door from it’s hinges if you need to get a sizable piece of furniture through. When you arrive to your new home, you want to get all of your belongings inside as quickly as possible, so you don’t want to waste time searching for your tools if they are buried beneath everything else. Having them at the ready will allow you to quickly and efficiently unhinge any doors if necessary. Not Hiring a Real-Estate Agent: One last mistake to avoid is not using an agent. Having the help of an agent will make the moving process a lot simpler. They have been through hundreds of these cases before, so they will be able to provide you with the information you will need in order to make sure everything goes according to plan during your move. With everything you have to think about when planning a move, it wouldn’t hurt to have some professional help at your side to give you advice. It will help you relax and will give you more assurance that everything will work out. There’s a lot that goes into planning and making a move, and we know there’s much to remember. But, if you keep a clear head and an optimistic attitude, this task will be easier than anticipated. It’s all about time management, and the more time you allow yourself to prepare, the more focused and less worried you will be about not getting everything done. This is a part of your life that will lead to an exciting change in your life, so despite all of the work that goes into this endeavor, enjoy it! Sometimes, if people try to sell their home, they may have trouble attracting a buyer. If you’re one of these people, you’re probably wondering what you’re going to do about it. Maybe you plan on consulting a realtor to change around the marketing, or maybe you’ll choose to take your home off the market for a bit. But, have you ever thought about putting your house up for rent? If you don’t have any interested buyers at the moment, renting out your home can be the next best step. It’s worth a try, so here are some tips on how to prep your home for renters. When trying to estimate a rental price, you have to realize the market is what establishes it. If you set the price too high, you’ll discourage potential renter from approaching you and expressing interest in the property. Determining the rental price isn’t an arduous task because all you have to do is talk with your realtor and conduct some research on the market, which will show you what prices other rental homes are asking for in your area. If you wish to find a renter in a timely fashion, it’s important to have a fair market price, not a price reflecting how much you think your home is worth. In order to have success when attracting renters, this is something you must remember. It’s important to walk through your home and check for any issues you may have to fix before you have any potential renters look at it. Just as if you’re getting your home ready for a buyer, you have to do the exact same thing for a renter. Check the plumbing, the heating, the electricity, and other amenities the renters will need during their rental period. If you aren’t able to sell the house, renters are the next best option, so you don’t want to drive them away with problems that should have been fixed before advertising your rental property to the public. When you go through your home to prepare for the renters, make a list of the furnishings you would like to take for yourself and which ones you don’t mind leaving with the renters. Even if the renters are responsible people, you never know if an accident might occur with a favorite furnishing of yours that is left in the house, so if you want that piece of furniture for your new home, you should definitely take it with you before the renters move in. After you pick out the furnishings you want, hire a moving company to take what you want for your new home. Take some time to find the best tenants. You have to make sure you rent out your property to people you know will take care of and respect your home. When you think you have found a possible tenant, your realtor will put them through a screening process and ask them to complete an application listing their name, employers, past landlords, and references. Once your agent gets in touch with the renter’s contacts, you will have a better idea of who the renter is and if you would like to approve their application. If you rent out your house to the wrong person, this be will pose a risk to your home suffering damage and will have you pulling out your hair with stress. 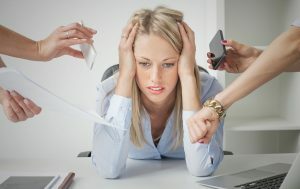 With the hard work it comes from being a landlord, stress is something you don’t need. If you’re having trouble selling your home, don’t fret over this bump in the road; you still have the option to rent it out. However, you have to remember there’s a considerable amount of preparation you must take to prepare for the renters to move in, just as if you were selling your home to a buyer. At least if you have people renting out your home, there will be less time the house is unoccupied. If you have a responsible individual renting out your home, you will know your home is in good hands until the right buyer comes along. Buying a house is a life-changing event, so you have to be careful to dodge mistakes that could cause setbacks in the home-buying process. In the beginning, you have to make sure not to hire the wrong agent. Just because someone might be a niece, nephew, friend, friend of a friend, or have any other connection with you, that doesn’t mean that person will work best for you. If you want the home-buying process to flow smoothly, you want to make sure your agent is communicative and dedicated to their work. Hiring an agent just because you may have a pre-established association with them doesn’t mean they’re the right agent to use, and a mistake like this can derail the process shortly after it begins. You shouldn’t feel obligated to work with someone just because you know them. The home-buying process is a fun, but serious task, and you want to have the most qualified professional on your side to guide you through it. Although looking at houses is the most fun part of the process, you can’t jump into it right away. First, you have to figure out how much the bank will loan you for a mortgage and get pre-approved. If you visit some properties prior to your pre-approval, you may be disappointed to find out they are out of your price range. I understand you’re excited about house hunting, but getting pre-approved for a mortgage is an important task to accomplish before you start visiting houses. Plus, having a pre-approval is a sign of determination that will show sellers you are taking the process seriously, which will help you stand out from other potential buyers. Similar to when you’re buying a car, never settle with the first “perfect” house you see, no matter how much you like it. If you do this, you’ll likely miss out on other possible houses that might have met your needs and interests. It’s recommended you keep an open mind about the several housing choices you have, instead of lunging at the first house that fits your criteria. I know the home-buying process isn’t something you want to prolong, and ending the process might be tempting if you find your dream house right away, but quickly attaching yourself to a house will likely do more harm than good, so visit a few houses before making your choice. You’ll feel a lot better having done so, and it’s always best to have multiple options. Speaking of wanting to speed up the buying process, buyers might sometimes choose to skip the home inspection in order to make their offer more appealing to the seller, which the sellers will like if they’re trying to hide any problems. Foregoing the inspection is something you should not do. A home inspection is very important when it comes to buying a house because the inspector will go through the property to make sure everything is in working order. If you skip this step and it turns out the house needs repairs, you’ll have to spend money to fix these problems, on top of having already bought a house for hundreds of thousands of dollars. Please forgive the cliche, but this is a sort of don’t-judge-a-book-by-its-cover situation because, although you are drawn to the house based on the details that are more apparent, you need a professional to find if there’s something you would have normally missed in your walkthrough. The real estate market is an unpredictable beast, and no matter how favorable it may look one day, you can never tell how it’s going to present itself the following day. Even if it looks like you’ll be paying a great deal on a house, you might feel compelled to wait and see if the price drops. While you may like playing the odds, waiting for a price reduction may result in hurting your chances on buying your preferred house, or even losing it to another buyer. The housing market is constantly changing, so leaving the possibility of a good price now for a better price later isn’t the wisest choice to make when dealing with something as big as a housing purchase, especially if there’s a chance of someone else swooping in and taking the house you wanted. When you buy a house, one of the last things you’ll probably think about is selling it at some point down the road. However, considering this actually makes a big difference. When you look at a house, you have to think about the possibility of selling it later on in your life. After all, it’s better to be safe than sorry. You never know, you may need a bigger house to raise a family, maybe you’ll have to move because of a job transfer, or you may find yourself wanting to downsize. In life, anything can happen, and it’s this reason why you should think about the resale value of a house before you purchase it. As a homebuyer, you want to find a house that’s as close to your liking as possible. While the prospect of searching for a new house is fun, you can’t let that excitement make you forget the important steps you have to take in order to prevent any mistakes from being made. There’s a lot of time that goes into the home-buying process, and diligence is key. If you work hard to evade any blunders that may get in the way of your search for a new house, your commitment to the process will be very worthwhile. Come back next week when we discuss the mistakes to avoid when selling a house! Believe it or not, there are some people who might choose to search for a new house without assistance from a real estate professional. While it may seem like the ideal route, I want to explain why working with a buyer’s agent is the way to go. There is a lot of work involved when purchasing a new house, and a professional will be there to guide you through the intricacies as seamlessly as possible from your initial search, all the way through your closing. When you’re buying a house, especially if this is your first time, you’ll want to have an agent with you who can answer whatever questions you may have. In the rare chance they’re not sure of the answer, they will find it for you and get back to you as soon as possible. Agents are very conscientious when it comes to keeping in touch with their clients, so if they have to get back to you on certain questions or have other bits of valuable information to share, you can be sure they will contact you in a timely fashion. The dedication of a realtor is the best tool you can have when looking for a house, so working with a professional who can help make the home buying process simpler is a huge benefit. Speaking of questions, you’ll probably have a few regarding the paperwork when it comes time to close on a house. I know “paperwork” is a word that causes some apprehension, but for a task as big as buying a house, it’s a necessary evil. While going through the paperwork, you’ll want to have an agent in case you require any help. If you need clarification on anything mentioned in the documents, you’ll be thankful your agent will be with you to help clear anything up because you want to make sure not to sign anything unless you have a full understanding of what’s been written. With everything the paperwork includes, it might be somewhat intimidating, but keep in mind that countless other people have gone through this same process, so you should have confidence that you’ll get through the procedure as well. Regarding the home’s cost, agents are up to date and experts in the market, so they know the current price trends and the true value of a house. With a professional backing you up, they can help negotiate with the selling party a price that will work for both you and the seller. Because buying a house is one of the most important financial decisions you’ll ever make, you want to be sure you pay a fair price and don’t get taken advantage of by the selling party. The negotiation process can be very tricky, so having a buyer’s agent at the table to discuss a fair deal with the seller’s agent is essential for a smooth transaction. When you have an agent, they will be able to assist you in narrowing down your choice of houses to the ones that fit your financial situation. Given your busy schedule, there isn’t any point in visiting houses that are out of your price range, no matter how nice they look, so using an agent will help you focus on which houses are more financially attainable. Besides finding houses that fit your budget, agents will also get to know what kind of features you’re looking for in a house. With an agent knowing the cost and qualities you want for your new house, they may find a suitable house you overlooked in your search, a house that may even become one of your final choices. Moving into a new house is one of the best moments you can experience. But, to get there, you have to make sure you avoid difficulties during the home buying process. With an agent involved, they will work hard to get you through the transaction as easily as possible, and you’ll be happy to have them. Selling a house is one of the biggest undertakings you can face in your life, which is something I’ve been saying a lot, lately. But, it’s one of those things you really need to realize when you’re about to list your home. As you’re getting ready to do so, you also have to think about contacting an agent. An agent will be a tremendous help during the selling process, so here are some reasons why you should hire a real estate professional. When you hire an agent, you won’t need to worry about having your time consumed by the responsibility of being available when a potential buyer wishes to see your house. With an agent, you’ll have a lot of assistance because they will be showing the house for you. Besides personal showings, agents will be able to host open houses where buyers and other agents are invited to tour your house. This way, you’ll be able to get multiple potential buyers in your house at one time and obtain a better idea of how much interest your house is generating throughout the community. When you have an agent on your team, they will be able to gather feedback from the potential buyers about your home. Normally, the buyers will provide their opinions to their agent, who will relay that information to your agent, who will then bring that information to you. This way, any awkwardness is left on the sidelines, and you will be able to receive honest opinions from the buyers because they won’t have the pressure of having to give their feedback directly to you. Marketing your home properly is extremely important. By having an agent on your team, they will be able to attract attention to your house through their list of contacts and marketing capabilities. As with any line of business, contacts are everything, so if you want to have the best chance at selling your house, hiring an agent with many contacts will give you a shot at meeting the results you’re looking for, and in a timely manner as well. With the technology we have today, the ability to reach hundreds of people is at our fingertips, and an agent will use that digital advantage to notify consumers that your house is on the market and waiting for an offer. Given how most people today use the Internet as their main tool for researching real estate, it’s a no-brainer your agent will work to attract buyers through computers, mobile phones, tablets, and other devices. With online tools, such as MLS websites and social media, your agent is likely to find a wealth of interested buyers. But, although we’re living in a world that’s becoming increasing electronic, additional marketing tools, such as flyers, brochures, and newspaper advertisements still hold power in the real estate industry. Determining your house’s selling price should be left up to an experienced professional. You will most likely harbor great memories of your house and price it to what you believe the value is based on your emotional attachment. The seller’s agent will come with comps of similar houses in your area, which will show the length of time these homes have been on the market, how much they are listed for, and how much they sold for. All of this will help when determining a realistic market price. Additionally, when you have an agent working with you, they will be able to add positivity to any negative feedback potential buyers may have about the property, and will possibly help with a resolve on a situation. Real estate agents are professionals, so they know what they’re doing and won’t steer you wrong. They are at your service and will assist you however they can. When selling something as significant as a house, placing it in the care of a real estate professional is the first step to a successful process. If you want to have the best experience you can when selling your house, do yourself a huge favor and hire an agent.